Not likely, but there is vegan food and Viking heritage to be found in York. There are also plenty of free things to do in York for those that are budget conscious. The original New York? Maybe. Or just the Duke of York came from here and renamed New Netherlands. York is small so you’ll get to see everything worth seeing within a few days. It’s a perfect weekend getaway or even a day trip. If you’re looking for the Yorkish experience on the cheap, here are some great free things to do in York in 36 hours. The Minster is likely the reason most people come to York. It’s the largest Gothic cathedral in northern Europe and is just as impressive as that sounds. The epic building dominates the city skyline – you can see it from everywhere while you’re walking along the historic medieval walls. Parts of the building date to the 8th century! You can go inside and climb the tower for views of the city, but we opted for the free option: circumnavigating the city via the medieval walls. The medieval wall used to entirely surround the city, but today there a few gaps. Most sections are still intact though and visitors can walk the length of it, pretending to dodge enemy fire while poking their bow and arrow through the crenelations. The large gates are impressive and transporting. Plaques adorn the ends of segments and provide short but detailed explanations of the historical significance of each part. In parts you can still see the original Roman walls on which the medieval portion was built. There’s even a coffee shop in one of the old towers! As you walk along the wall trail, you’ll come across other points of interest, such as Clifford’s Tower. William the Conqueror built this tower to maintain control over the area. Today it hardly looks very imposing, but you can climb up it and get great views of the city. You can even dress up like a knight and pretend you’re the next conqueror of York. England’s most medieval street may well be The Shambles, as here you can still see buildings from the 14th century, leaning tiredly on their original foundations. The Shambles is an old term for an open-air slaughterhouse and meat market. There used to be dozens of butcher stalls lining the street – thankfully none of that remains to this day. Head to the nearby Shambles Market for some old photos of what the area used to look like. Today’s shoppes hardly have the original slingers, but some are older than others, so poke around. The Shambles is also a great market, but outdoors! You can find some decent deals on produce, which was quite a surprise. The Shambles are part of the network of Snickleways – the medieval alleys of the center of York. 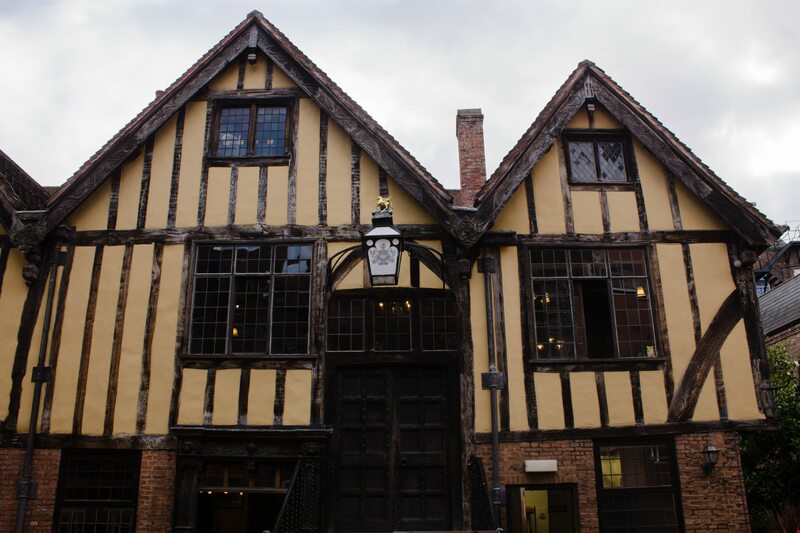 No visit to York is complete without wandering down them in search of a hidden alleyway or unique shop. The river Ouse (pronounced like ‘Ooze’) cuts right through the town. During different times of the year, the river swells and floods the city. The abbey originated in the 1000s and used to be the richest abbey in northern England. Walking the quiet grounds, you can almost imagine the monks walking what would have been the halls and corridors. Even though the church of England was incredibly powerful, the large ruins are a testament to the fact that nothing lasts forever. The abbey was dissolved in the 1500s during the mass dissolution of the monasteries during Henry the 8th’s reign. At this point, you may be chock full of history and just want a break. Luckily, York has many quirky shops to pop into as well as tea or coffee shops. Just be aware that most things do close at 5 pm! If you’re a cat fan, The Cat Gallery cannot be missed. With some of the silliest cat memorabilia around, you may even consider buying some. Sam swears he was here last time, and I wouldn’t be surprised – he’s earning his keep. Quite the dashing daredevil, juggling fire on top of an 8-foot unicycle blindfolded – he certainly captured our attention. Eventually, you’ll get hungry. And the good news is you’ll not be burdened with indecision. While there are vegan options available, there’s only one 100% vegan spot and it’s well worth a visit. Turns out this is one of three restaurants by the owner. We realized on walking in and seeing familiar decor that, we had tried another one in Granada, and left a bit disappointed. Fortunately, we had quite the opposite experience here. Sharing the tasting platter is a great way to try everything, and we were thoroughly impressed. Our savory sensors were saturated and thoroughly satisfied. Then to top it all off, we all split a mousse. Everything here is homemade and “free from” (what the Brits love to call their special dietary food, like no nuts or dairy, etc). We’d come back here again. While it was a bit pricey, the food is super artisanal and well worth it. When we walked by a noodle place with a line almost out the door, we knew we had to check it out. Wok and Go offers simple box noodles, but then we saw the reason for the line – a 2 for 1 deal only on Tuesdays. If you want to get some serious mileage from your pound, split this with a friend and you’ve got some solid vegan fare. Not overly oily or fried, and they stuff the boxes. Not for the low carb crowd. If you find yourself exploring the North of England, don’t miss this historic town. If you were coming from Glasgow as we did, we’d recommend taking the train to Edinburgh, then stopping here on your way down to London. Do you know any other free things to do in York? Share in the comments below! Pin Free Things to Do in York! Posts written by Sam and Veren are collaborative, informative posts that we write and edit together. These posts include our vegan city guides and informative house sitting and expat life in Spain posts. Hi! We're Sam and Veren, a couple originally from New York that is now based in Madrid, Spain. We slow travel on a budget via housesitting and aim to show that neither traveling nor eating vegan has to be expensive or difficult. @2018 - AlternativeTravelers. All Right Reserved. We are a participant in the Amazon Services LLC Associates Program, an affiliate advertising program designed to provide a means for us to earn fees by linking to Amazon.com and affiliated sites.